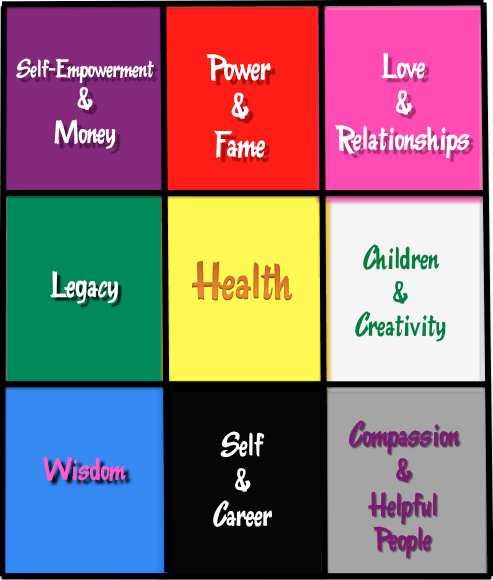 Ok, so messy others are filling up certain areas of your home’s feng shui bagua plan? First order of business: draw out the bagua map above and take it to siblings and others and explain how their mess could be screwing up the family home and making everyone’s life a bit more difficult. Offer to help straighten up and do not be accusatory or judgemental. Its hard, I know. Messy people mess with my sense of well-being too! Next on the list is your own question about feng shui for your room. Just do it. Will it be enough? It might have to be, so decide that it will be because we can only control so much in our lives. For example… If you look at an apartment building, your position in the building will affect your life, technically speaking, and if someone less than pristine lives in your building, they are, essentially, screwing up the feng shui bagua. Its true… but what can you do? Take care of what you can control. You might inspire change beyond your four walls! Thanks so much for taking the time to answer this, I sincerely appreciate it! I will do my best and hopefully be able to report good changes in the future! thank you , and to you wonderful miss Dana ! Previous post: Fast Feng Shui : Glass Tupperware! Next post: Chantal Moore’s Best Of Balanced Beauty In 2012!